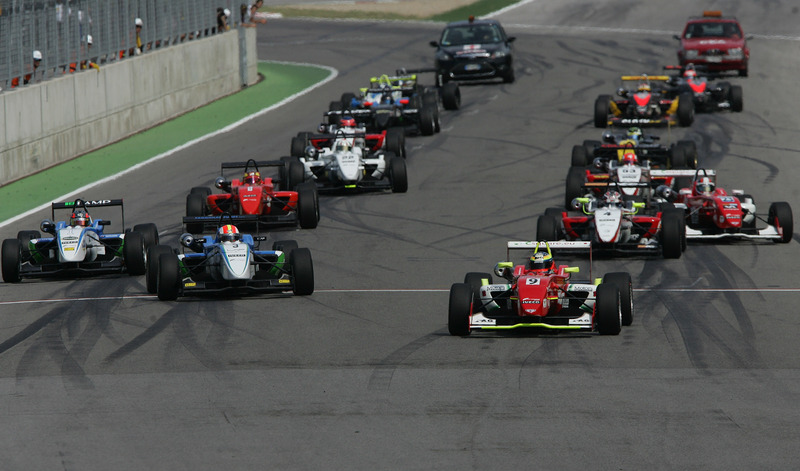 ITALIAN FORMULA 3 2012 SEASON, EVEN MORE ATTRACTIVE AND INTERNATIONAL! Among the important confirmations and appealing innovations, the 2012 season of tricoloured Formula 3 looks even more fascinating. Eight-round calendar of international importance with the birth of the Italian Formula 3 European Series; format of the events on three races; prize money of 222,000 euros; TV live of all the races on Raisport; TV international coverage on Eurosport; dream prize Test at the wheel of Ferrari F1 for the Champion and the Rookies’ Champion. Does it exist in the world another F3 championship that offers more? 07/12/2011 - For the Italian Formula Three Championship the 2012 will be even better, full of news and ever more firmly based on the most popular and exclusive confirmations. First of all, in its 47th edition, the prestigious national series powered by Fiat Powertrain Racing adds an exciting blue flag, with stars in circle, as background of the always emotional three colours green-whit-red. The first innovation is thus an European skyline that now finds expression in a calendar of events of international level and the indiction of a new title, the Italian Formula 3 European series. On the eight events on the calendar, in fact, three will be held abroad and specifically in Spain (Valencia 01/04), Hungary (Hungaroring 06/05) and Austria (Red Bull Ring 05/08) and five in Italy, on the most prestigious race tracks (Mugello 10/06, Misano 08/07, Imola 02/09, Vallelunga 16/09 and Monza 21/10). As per the list to follow, all events of the season will be valid for the Italian Formula 3 European Series, while the events in Italy and the one in Zeltweg (Red Bull Ring) will be the six rounds of the Italian Formula Three Championship. ALL EVENTS WILL BE IN A "3" FORMULA. In terms of race weekend the Championship adopts a "3" formula... In fact it will be three races at each event, thus introducing another important news for the next season. Official collective tests will be held on the Thursday of each racing weekend at the Italian circuits hosting both the Italian Championship and European Series races. Free practice rounds for a maximum of 90 minutes will be held on the other circuits. The qualifying practice will be held in two 15 minutes sessions spaced by 5' neutralization. There will be 3 races each week end: the first will last 22 minutes +1 lap with grid on the basis of the first qualifying session, the second 15'+ 1 lap with grid on the basis of race 1 classification reversed in the top six and the third 30'+1 lap with grid on the basis of the second qualifying session. The higher scale scores is for race 1 and race 3 (20-15-12-10-8-5-4-3-2-1) rather than race 2 (13-11-9-7-6-5-4 -3-2-1), while a point will be awarded to the authors of the fastest lap in the three races and the pole position in race 1 and race 3. About the prize money, it will be confirmed the already generous cap fixed in the last few seasons, but to innovate it is the shift from championship to race’s prize. In fact, in every weekend it will be distributed more than 15.000,00 euro in race’s prize, for a total amount of 80,000 euro for the Italian Formula 3 European series and 42,000 euro for the Italian Formula Three Championship. The race’s prizes of Italian F3 Euroepan Championship and Italian F3 Championship can be drawn concurrently. At the end of the season, however, the winner of the Italian Formula 3 European series and the winner of the Rookie of the Italian Formula 3 European Ranking Series will be awarded 50,000 euro each. Already protagonist of the Italian Formula Three Championship new course opened in 2008, the 2.0 16V engine will be provided by Fiat Powertrain Racing also for next season. In order to deny any kind of intervention, the engine will be delivered with two different seals, one supplied by Fiat Powertrain Racing and one provided by the CSAI. Any repair, revision or preparation of the engine must only be carried out by Fiat Powertrain Racing, which will then seal the new engine. In the case of a second revision or replacement of the engine, the driver will see his relegation of eight positions on the grid. The main innovation concerning the engine for 2012 is represented by a new regulatory provision. The driver who will get more points in a single event, in the following weekend he must use a new engine that will be delivered by Fiat Powertrain Racing. Even in 2012, all races will be broadcast live commentary by RaiSport, RAI national sports channel unencrypted on digital satellite and terrestrial. The news on the TV field is in the magazine fully dedicated to news and insights for each weekend of the season and that will be aired on the international sports channel Eurosport in 20 languages (English, French, German, Italian, Spanish, Portuguese, Dutch, Swedish, Norwegian, Danish, Finnish, Russian, Polish, Czech, Hungarian, Romanian, Bulgarian, Serbian, Greek, Turkish, Cantonese). Through the presence on Eurosport the Italian Formula Three Championship and the Italian Formula 3 European Series will bring the benefit of an international audience of 59 very different countries (in Europe, Indonesia, Australia, Hong Kong, Singapore, Thailand and Malaysia). It is the most beautiful and awaiting confirmation. The Champion and the Rookie Champion of Italian Formula 3 European Series will drive for a full day of testing at the wheel of Ferrari F1! The prize of a dream, that only the Italian F3 Series is able to offer thanks to the Scuderia Ferrari and Ferrari Driver Academy, will be in its fifth edition.